Most internal medicine practitioners, leaners and attendings alike, include “code status” as an issue on an in-patient’s problem list. Often “not addressed overnight” or “needs to be discussed” is left as the plan. Generally, clinicians appreciate the importance of this task. Most, however, confuse this medical treatment decision – what is the patient willing to consent to as treatment if his/her condition were to seriously deteriorate? – as advance care planning or goals of care. Even more problematic is the need to answer these treatment consent questions in an Emergency Room when the patient is acutely ill. Yet, even once the patient is more stabilized on a Medical Ward, conversations about goals of care are often still reduced to binary yes or no questions about cardiopulmonary resuscitation and/or Intensive Care Unit admission. All too often, once the CPR status is determined, a more robust, patient-centered goals of care conversation ceases to continue. Most physicians and trainees feel inadequately prepared to conduct difficult and comprehensive goals of care or end-of-life discussions (1, 2). Despite the disconcerting data indicating that many cancer patients have their first end-of-life care conversation during an acute hospitalization (3) or that many dialysis patients never have these discussions at all (4), a change in practice has been slow and difficult. This cascade of unfortunate events and missed opportunities results in a worrisome mismatch in treatment and care plans between what is documented by clinicians and what the seriously ill patient has already thought about (5). We need to become less accepting of discharge summaries that read: “Code Status: the patient was full code in hospital. This should continue be explored as an outpatient.” These conversations have been incentivized for the physician through Advanced Care Planning billing codes, as outlined by This Changed My Practice contributor Dr. Catherine Clelland (6, http://thischangedmypractice.com/acp-for-patients-with-multiple-co-morbidities/). Furthermore, with data demonstrating the benefits of early goals of care conversations (7), these conversations must shift to being commonplace for patients across the continuum of care. Published in JAMA Internal Medicine in 2014, Bernacki and Block discuss the complex topic of communication about serious illness with patients (7, 8). In the article, patient, physician, and system factors, which impede early initiation of advance care planning, are examined. The reader is made more aware of his/her own internal processes that may delay or prevent goals of care conversations with their patients. Equipped with this insight, the medical practitioner is more readily able to surmount those factors and converse with patients about their wishes. Some of the greatest lessons in this article stem from the data demonstrating that patients and their loved ones generally do want to be informed about the trajectory of their illness and be given an honest and true prognosis (7, 9). Furthermore, Bernacki and Block provide many references indicating that earlier goals-of-care conversations do not harm patients by way of anxiety or hopelessness (3, 10, 11, 12, 13). Relaying this evidence-based message to patients and their families has opened the door for richer advance care planning discussions. By reassuring them with this evidence, we have witnessed fewer families working to “protect” their loved ones by avoiding difficult conversations about the patient’s state of health. Bernacki and Block also introduce the Serious Illness Conversation Guide developed by Ariadne Labs, a joint center between Brigham and Women’s Hospital and the Harvard T. H. Chan School of Public Health in Boston (14, 8). This guide provides a framework for physicians to engage in care planning with patients in a manner acceptable to the patient. In addressing the elements of the guide – seeking permission; determining current understanding; providing prognostic information; determining patient’s goals, fears/worries, strengths, critical functions, and treatment tolerances in context of the prognosis; summarizing; and recommending next steps – physicians can meaningfully address the nature and trajectory of the illness, how it may impact a patient’s quality of life, and how a patient might wish to live in this likely functional and prognostic reality. The authors also provide communication tips, borne out in the literature, in an effort to facilitate more effective discussions. S – Do you know who would be your Substitute decision maker? Do you have a Representation Agreement? P – What are your Preferences for decision-making and who helps you make medical decisions? E – Are there any prior Expressed wishes about the types of medical treatments you would want or don’t want? Do you have an advance care plan? A – Have you completed an Advance Directive? K – What other medical Knowledge do you need to do further planning and make medical decisions? The answers to these questions in the ER, especially if the patient’s responses are informed by previous outpatient serious illness conversations, along with serious illness communication once they are stabilized as inpatients, have allowed us to enhance our engagement with patients on goals of care. 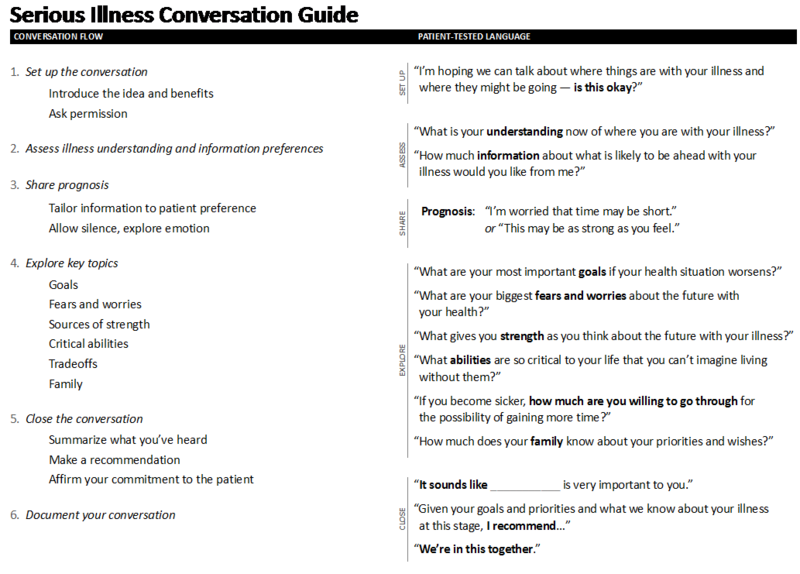 Using the Serious Illness Conversation Guide once patients are admitted and stabilized, we have been able to extend the “code conversation” to a holistic patient-centered discussion about distinct goals and fears, and to understand how individual values inform patient decisions about current and future health care. Utilizing the tool provided by Ariadne Labs, and documenting and transmitting the information well, we feel we are able to more readily understand the perspectives of our patients and their families, enabling more robust discharge planning, more appropriate follow-up, and better communication with family physicians and other specialists involved in a given patient’s care. It would be helpful to here approaches to help patients understand exactly what “full code” means. I feel like my patients have a hard time understanding the sequelae after the initial resuscitation phase. This is a good framework for discussion. This information is well presented & helpful. Dr. Chen, I understand from staff at Ariadne Labs that you have adapted the Conversation Guide to use with health care proxies. I am director of palliative care for a large elder care organization in Boston, Hebrew SenioriLife, and we would be very interested to see what you have developed. Can you tell me where to find this?